Firstly we’re going to start right back at square one, so you have an appreciation of what protein is and what it does in the body. Ultimately, this is going to help later on when we get into a little more of the detail. If you were to open up my fridge on any given day of the week, you’ll see one of two things. Either a stack full of fresh meats or rows of Tupperware with delicious meat-based meals for the week ahead. And this is all because I know how important high quality protein is to the diet. And it becomes even more critical for people just like you that are looking to build muscle and lose body fat. Protein is one of 4 macronutrients (a macronutrient being a type of food required in high quantities in the diet). It’s these macronutrients (often referred to as macros) that are your body’s source of energy, which is provided in the form of calories. The four macronutrients are Protein, Carbohydrate, Fat, and Alcohol (yes alcohol). But for the purposes of establishing a healthy and effective diet we sadly ignore the latter macro. And while alcohol is the least important macro, undoubtedly, protein is the most important macro. If you want a bigger and leaner physique, protein is going to be a cornerstone of your fat loss and muscle building goals. Proteins can be broken down into 20 amino acids, which are the building blocks for lean muscle growth. Proteins help muscles repair, recover, and grow post workout. All that brutal training in the gym is going to turn into muscle growth with the help of protein. It’s also going to play an integral part in limiting muscle loss when you start to shred that unwanted body fat. So the lesson here is… if you want that lean and muscular physique you need to pay attention to your protein consumption (which not enough people do). Over the years my social media responses to this type of assertion have decreased in tolerance and length. Because claims that high protein diets cause kidney problems, osteoporosis, damage to the liver, etc are totally unfounded. In fact even the most cursory of glances at the available research shows that a high protein diet doesn’t cause any such problems. And in addition that, there’s clear evidence to suggest that restricting protein intake increases the risk of osteoporosis, not the other way around. I for one am living proof that a high protein diet has a positive effect on bone density. Because back when I was heavily into my cycling I went through of phase of not eating meat and not focusing on protein intake. When I broke my hip a few years ago, after crashing my bike on a training ride, tests showed that I had osteopenia in the spine and borderline osteoporosis in the hip. That’s basically thinning of the bones and nearing brittle bones. But thankfully, after a couple of years of a controlled, high protein diet my bones are back in the normal range. It may be a study of one, but it’s a genuine ‘real world’ example that backs up the existing scientific research. The recommended daily allowance of protein is 0.36 grams per pound of body weight (or 0.8 grams per kilogram). And while this may be enough for those leading fairly sedentary lives (and even that’s debatable), it simply isn’t enough for people leading a more active lifestyle. And it’s especially true if you’re a regular lifter seeking to lose fat and build muscle. To put the RDA into perspective a man weighing 80kg (177lbs) would be consuming around 63g of protein per day if following those guidelines. And that’s super low when you compare it to the available research out there. So how much protein is the right amount? Well, the popular theory is that 1g of protein per pound of bodyweight is the optimal amount per day for resistance trained individuals. But is this popular theory fact? In order to answer that question, we need to look at the fitness and bodybuilding industry as a whole and also aspects of the human condition. And here’s what I mean by that. How much protein we consume as gym goers is broadly derived over a number of years from the diets of pro bodybuilders. In the early days of bodybuilding, the level of information and research available today simply wasn’t around. So these guys were the trailblazers. They experimented with what worked and their success filtered down over time. It’s somewhat logical, on face value, to follow the diet principles of these muscle mountains. Because despite the fact they’re taking those extra “supplements” you won’t find in your local health food store, surely you can maximise your natural potential by following their principles, right? Unfortunately, that’s not really the case. In fact steroids greatly increase the body’s ability to synthesise protein, which means the more protein you consume, the more your body will use. However, as we’re looking at doing this naturally, that rule doesn’t apply. In addition to that, those pesky supplement companies obviously have a vested interest in promoting more protein consumption, because ultimately you’ll end up buying more products. Now, that’s not to say that all supplement companies work like that, but a lot of them do, so always be wary of their ‘advice’. And then there’s us as humans. We often latch on to a something that we believe is good for us and then go to town on it. So if someone tells us that a high protein diet is good, then surely the more and more you have, the better? That leads to drinking your way through litres and litres of protein shakes. Not to mention all those protein bars, protein cookies, and protein ‘whatevers’. But we’ll get on to that a bit later. At the end of the end we’re simple creatures and 1g per pound is real easy to remember and sticks in the brain. But that doesn’t mean it’s actually the optimal amount. That last point about 1g per pound being easy to remember is actually an argument in favour of theory. Why? Because compliance and adherence are king! If using 1g per pound of bodyweight helps you remember how much protein to eat every day and helps you stick to your plan, then goddamn it follow that! When all is said and done, there’s nothing wrong with consuming higher amounts of protein. Because any amount the body can’t use to build muscle will get converted to energy. It’s just that it’s not going to be your most efficient source of energy. And not to mention the fact that all that meat and those protein supplements is gonna be damn expensive! Studies show the more accurate target for protein consumption is nearer to the 0.8g per pound mark (or 0.82g to be precise). If we quickly think back to our example of a man weighing 80kg, he would now be consuming 142g of protein per day, with this approach. More than double the RDA. And as I mentioned before, you can eat more protein if that’s what you enjoy. But just know that to build muscle, how much protein you consume doesn’t need to exceed 0.8g per pound for the vast majority of people. And that’s a key point. As with most things, this are guidelines and everyone is different. You may find you react better to a higher protein intake. If that’s the case, don’t be afraid to push it up a bit, as long as you’re staying within your overall calorie targets. If you’re like me and a bit of a geek when it comes to this stuff, a great article to check out on the subject is this one by Menno Henselmans, which you can find at bayesianbodybuilding.com. Does how much protein you eat need to change if you’re goal is to drop body fat? You’ve worked hard for those gains. And naturally you want to keep hold of them as you drop weight and body fat. So what do you do? In this scenario, I recommend erring on the side of caution and upping your protein intake to around 1 – 1.2g per pound. Now there a studies that show that you don’t need to do this. But equally there are studies that indicate you should. In the face of these conflicting opinions it’s worth opting for a slightly higher protein intake. Preserving muscle is priority number one. It’s hard to get it, so you going to want to do everything you can to avoid losing it. So increasing protein intake for a few weeks while you’re cutting, seems logical in the face of no definitive scientific answer. And this is exactly where I start with my coaching clients. Once you’ve got a start point to work from you can easily tweak that based on circumstances and what works for you. It’s all about getting to know you, how you work, and then dialling that in for success. Not all protein is created equal. Some sources are better than others and yield more bang for your buck. So on that basis, which ones should you be loading into your meal plans for optimal results? When answering that question you need to consider a couple of factors that determine the quality of a protein. Different types of protein are processed by the body at different speeds. The amino acid content / profile differs between sources. How much of a food’s protein that can be utilised by the body also varies. So let’s take a look at a few common protein sources and see how they stack up. Whey is something you’ve no doubt heard of. These days everyone’s got a huge 5kg tub of the stuff in their cupboards. The reason why whey protein is so popular for protein shakes is that it is quickly absorbed by the body, compared to other sources. So those nutrients are getting to your muscles marginally quicker, post-workout. Now in the grand scheme of things, this difference is marginal at best. You probably wouldn’t even notice the difference in your results between drinking a shake post workout and having a chicken breast. But a shake does have a massive convenience factor. Added to that, the body can use in excess of 90% of the protein content and there is an abundance of essential amino acids. This makes it a great protein source. That being said, you don’t need to guzzle down 10 protein shakes a day just because the protein quality is good. In fact, quite the opposite is true. Because most of your protein intake should come from fresh whole foods. Those whole foods will give you additional nutritional benefits and are likely to keep you feeling fuller for longer, which is especially advantageous on a cut. These have been bodybuilding staples for decades for good reason. With high biological values and an abundance of amino acids, you can’t really go wrong with these as sources of high quality protein. And those little white orbs are pretty inexpensive too. So it’s win win for the humble egg. Again these are bodybuilding staples and all weigh in as good quality protein sources. If your budget can stretch to it always opt for fresh sources. Processed meats aren’t all that bad, but they’re going to have chemicals and additives that aren’t present in their fresh counterparts. The rule of thumb, as with most things is moderation. Eat them occasionally, but don’t make them the cornerstone of your diet. And what about the vegans and vegetarians among you? Well, in the world of protein, animal sources win out by a long way. Studies have shown that animal based proteins are more easily digested and processed by the body than plant based sources. Moreover, getting enough protein in a vegetarian / vegan diet can be a challenge. And that’s especially if you want to make that meal plan at least a tiny bit interesting. The amino acid profile of plant based foods simply isn’t that great. And it means you have to eat a ton of the stuff to be on par with animal sources. This article by Mike Matthews over at muscleforlife.com compares amino acid profiles of steak and broccoli as an example. In my opinion, it really highlights the difference. Having said that, you can still build muscle and get lean on a vegetarian / vegan diet. It just means you have to plan your food intake a bit more and adjust your macros to suit. These days you can pretty much get a protein version of every food type imaginable. Protein ice cream, protein pancakes, protein cereal, protein pizza, protein beer, protein bread, protein cheese. The list is never ending! But is any of this actually of benefit or are they gimmicks praying on people’s perception that protein = good? So without wishing to sound to ‘ranty’ let’s keep this straight forward. You do not need any of these foods in your diet to achieve your goals. If you have your meal plan set up correctly, normal versions of the same foods can fit in your diet. And just because it has protein in the title, doesn’t mean it’s good for you. Heck, half the time there’s barely any protein in them anyway. Let’s look at Weetabix Protein. The regular version of Weetabix has 4.5g of protein per 2 biscuits. That’s compared to the protein version, which has 7.6g per 2 biscuits. To me an extra 3.1g of protein hardly redefines this as a protein food. And then there’s the ingredients. Scanning the ingredient list and you’ll see that the protein sources used are incredibly poor quality. In fact in terms of how much of that protein your body will end up using probably means the net protein difference is about 1 – 1.5g. My advice would be to get those 3.1g from some other sources. Then there’s protein bread. For this comparison, I’ve looked at Tesco high protein wholemeal bread versus their regular wholemeal version. According to the nutritional information there’s a whopping 0.5g of additional protein per slice in the high protein version. I know what you’re thinking. What an amazing difference! 0.5g of low quality protein is going to make no difference to your diet and results. And not only is the amount of extra protein not even worth mentioning, you actually get 30% less bread in a loaf and it’ll cost you 60% more. What a great deal that is! It’s clear that the trend for these protein foods is exactly that, a trend. To me, it’s nothing more than a marketing exercise. And sadly it’s a marketing exercise that works. My advice would be to buy the regular version and source your protein from higher quality sources. 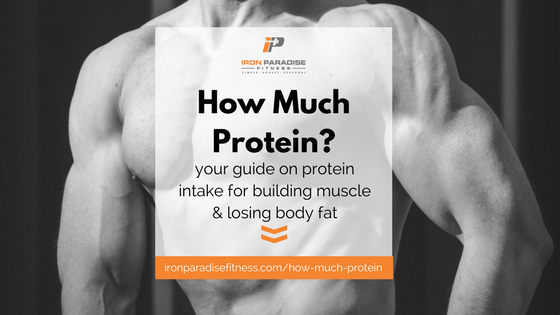 In summary, the right how much protein you need depends on your goal. If you are building muscle, you don’t need much over 0.8g per pound of bodyweight. And if you’re losing body fat, you can push that up to 1.2g per pound to preserve muscle mass. As for protein sources, fill your meal plan with high quality protein sources like fresh meats and eggs. And as for those protein foods, save your money and don’t get hooked in by the marketing. I hope you found the article useful. If you want more information on nutrition then grab my free eBook here.